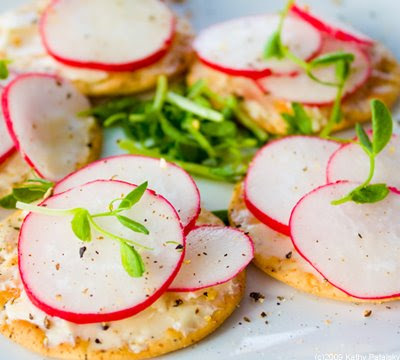 Radishes with "Butter". Classic French Gone Vegan. Soggy Sunday. It has been a muffled, gray, dizzy Sunday. Skipping around our neighborhood, my husband and I escaped several sudden rainfall downpours by ducking under our green umbrella and darting into an empty cafe until the downpour faded a bit. We sipped our soy lattes slowly, but the rain-it never faded. Soggy streets beckoning us home, we tip-toed through the puddles, my hair still dry, but my feet swamped in downtown gutter muck. History of Radishes and Butter. The French have been nibbling this simple snack for many years. For breakfast, lunch, before meals or as a bedtime snack. In France, radishes may be served whole with a side dish of sweet or unsalted butter. One tip is to cut an "x" in the tip and dip the radish directly in the butter. I prefer the classic way to slice them thinly on an open-faced starch. 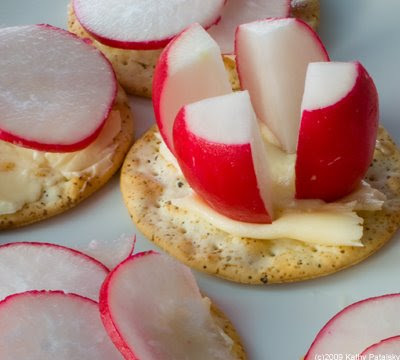 At Prune restaurant in NYC, you can get a bar snack or radishes with sweet butter and kosher salt for only $5. 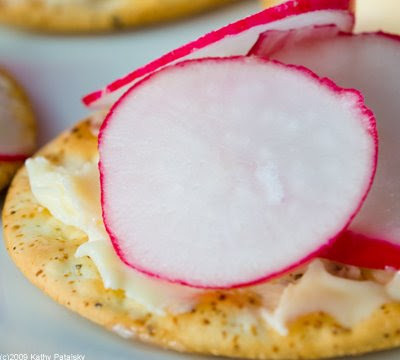 Not vegan of course, but I bet chef Gabrielle Hamilton's radishes are green market-amazing! 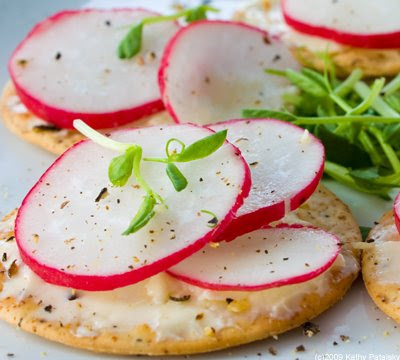 Radishes with Butter How-to. 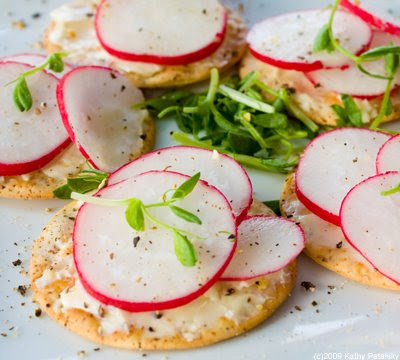 You'll need three basic ingredients for your elegant snack. Radishes. Butter (buttery spread that is vegan is the ideal. You save 4.5 grams of saturated fat by not using real butter. And it's animal product free. You also save 20 calories and 2 grams of fat (total) per tablespoon.) The other necessary ingredient is some sort of starch. A toasted baguette, dry cracker, soft bread or simple toast. I randomly had some garlic and herb Carr's crackers in the house so I chose those to use. A healthier version would be with some whole wheat or grain crackers, but that's for next time. The last ingredient is thick cut (kosher) salt or Fleur de sel. I actually left this added salt out since the buttery spread was salty enough for me. *toasting your bread is optional. *you can also use the long radishes-very elegant. 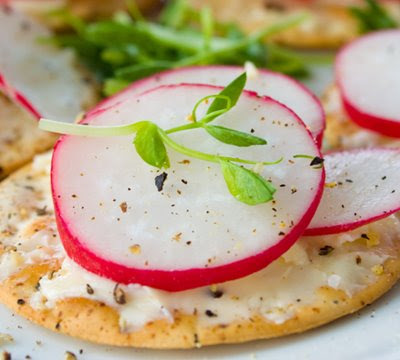 Spread a pea sized drop of buttery spread on each cracker of bread slice. Slice your radishes as thin as you'd like. Layer about 3 radishes on each piece. Grind some fresh black pepper over top. Add a few pinches of a chopped spicy or crisp green on the plate. Parsley, pea shoots or arugula work fabulously. Turn on some French music, an elegant foreign film, or Breakfast at Tiffany's and enjoy your snack with a friend! ...I probably won't make this a habit snack. Too much "buttery spread" but for a dinner party or a lazy Sunday afternoon, I love this idea. And radishes are awesome. Get some big fat ones fresh from the farmers market and make them the spotlight ingredient as you serve. 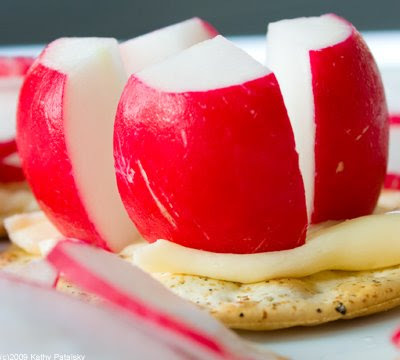 You can even do a ration of 1 buttered cracker to every handful of radish slices. Now that's healthy and tasty. 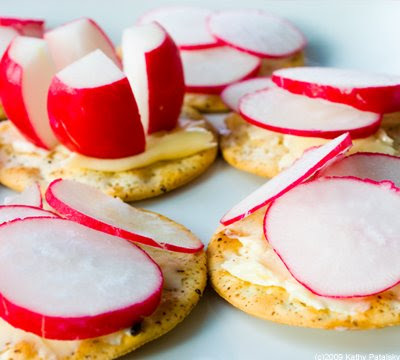 Spicy radishes can stimulate digestion and I read once that they can help with acid reflux issues. 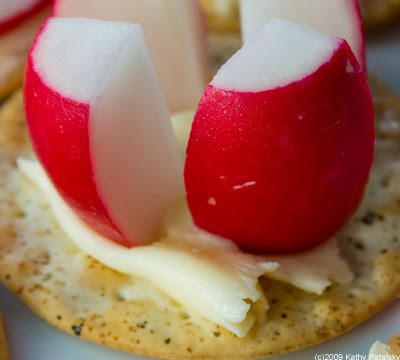 Radishes rock.